Kick the day off with our Chocolate-Hazelnut Iced Latte Recipe. 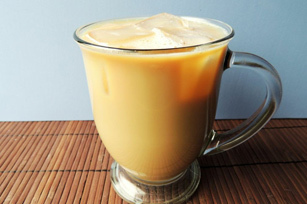 Or prepare this iced latte recipe later in the day when you want a moment of tranquility. Empty contents of single serve stick into a glass. Add milk, syrup and sugar. Stir well. Serve with ice and enjoy.